Was $50, now only $39! Do you find yourself unable to relax at night, your mind racing from one thought to another? How often does it occur? Have you resorted to addictive and dangerious pills, drugs, and medications for relief? Maybe you have given up all together and forced yourself to accept these sleepless nights as just a fact of life? 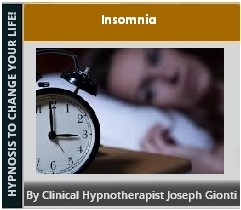 This does not have to be part of your existence because our powerful Insomnia Hypnosis Program can help you take back control of your life! Falling asleep sounds easy, but the reality is many of us struggle with it on a regular basis. We lay in bed at night tossing and turning, our minds racing with worries and lists of things to do. The minutes turn to hours as the ever-approaching dawn threatens to drive us mad. We flip through channels and thumb pages of books hoping our minds will be distracted just long enough to drift into a slumber. Yet night after night the insomnia remains. It’s a frustrating feeling not being able to sleep. It robs us of much needed rejuvenation and causes us to slip from our usual resolve. Our stress levels increase as a result, creating a vicious cycle as our bodies battle to relax. Sometimes it’s a medical problem or chemical side effect that prevents us from getting the rest we need. No matter the cause, the results are exactly the same. Another unsettled night followed by an exhausted day. Your subconscious mind is what helps your body function and regulates many of your automatic behaviours. Hypnotherapy can help you access this part of your brain through deep relaxation and visualization techniques. In this place you can learn to develop a regular sleeping pattern and say goodbye to the frustration of restless sleep - beginning today! After making your payment, simply click the "Continue to Website" or "Return to Website" link which will bring you to the folder that contains the files for your program. 1. Your actual hypnosis session audio: This is the same exact type of session that we would perform if you came to our office for a live hypnosis session. You will want to listen to this audio at least 2 to 3 times per week, as needed. You will also want to listen during quiet times and in a setting where you can fully relax. 2. Your subliminal audio: This audio is specially created using subliminal messages that are embedded into background music. It is extremely powerful and effective because while you are listening to relaxing music, your mind is hearing the messages and changing. It will also stay fresh, because you will want to continue using it over and over. You can listen to this audio around the use of your main program audio but at a minimum, you should use it at least 2 to 3 times per week. Everyone is different - so as a general rule of thumb, we recommend listening to each audio 2 to 3 times a week. However, because they are 100% safe and relaxing in nature, you can continue to listen as often as you'd like and for as long as you'd like. Although it's not required, we do recommend listening with headphones or earbuds as it will get you more into the session while cutting out distractions and everyday noise from your surroundings. Another important tip is DO NOT listen while driving or performing any other tasks that require your full attention. Final Tip: Just like any other self-help product or service, you have to be realistic and stay motivated. When you come to us for live sessions, we are following up with you, setting, booking and confirming your appointments and more. With download audio programs, you are opting to do things on your own. So mark your calendar, set an appointment reminder or do whatever else it takes to remind you to keep working towards your goals. Follow these simple tips and directions and YOU TOO, will the begin to enjoy the healthier and happier life that you deserve. Your purchase of this item is governed by the terms and conditions contained in the End User License Agreement ("EULA") which can be found at www.rihypnosis.com/eula.html. Please read this End User License Agreement carefully before completing your purchase. By completing your purchase, you agree that you have read the EULA and agree to be bound by its terms.